James of St George built Conwy Castle for Edward I in 1283. 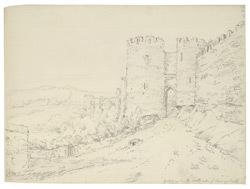 Conwy was one of several castles built along the Welsh-English border in Edward's bid to subjugate the Welsh. To support Edward's authority in the area, an English garrison town was established here, and so the walled-town of Conwy was built contemporaneously with the castle. Both town and castle provided a formidable defence against external threat. The castle was not built according to a traditional "concentric" plan, but was laid out on a linear design. A barbican stood at each end and the interior was divided by a cross wall, thus creating two separate strongholds. The first test of the castle's strength came in 1295 when Edward was besieged during a rebellion led by Llywelyn the Great. The Welsh were unsuccessful and England's hold remained intact. Over the centuries various additions and repairs were made to the castle. After the Civil War in the 17th century, the castle fell into disrepair. Restoration work began in the 19th century and today the castle stands with much of its medieval strength revived.